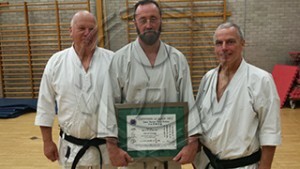 Congratulations to Sensei Dave Scregg who graded on Sunday 13th September 2015 and was successful in attaining the grade of Yondan (4th Dan). Dave is a well respected member of the club and it is with great pleasure that I announce this award. Over the 27 years Sensei Dave Scregg has been part of the CSKA, he has made not only the club a fantastic learning environment but he also instils life values, discipline, courtesy, self-esteem, focus & concentration within students past and present. Due to Dave’s method of teaching/coaching, parents have said that his method of developing students’ concentration also assists their children academically. Very well deserved Dave, congratulations.